1 3/4" Tubing / 6' Tall / Weighs 9,100 lbs. center of the unit that is 48' long. 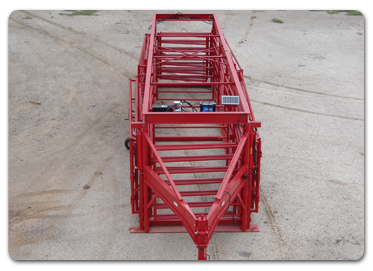 of double 6' gates that open between the split goose-neck hitch and between the rear axle assemblies. corral or stock trailer in the field. to move lift it up for transport. charged by a solar panel. the rancher can begin unfolding the panels. Rear panel #1, on a caster wheel, unfolds first. Then #2 panel will swing out on the caster wheel carrying the #3 with it. moved into place and locked with a double chain. Next step is to release the #4 panel and roll into place. Lift the #5 panel from the #4 panel and roll into place, double chain this #5 to the #2 & #3 panel. This is one side of the sorting system completed. 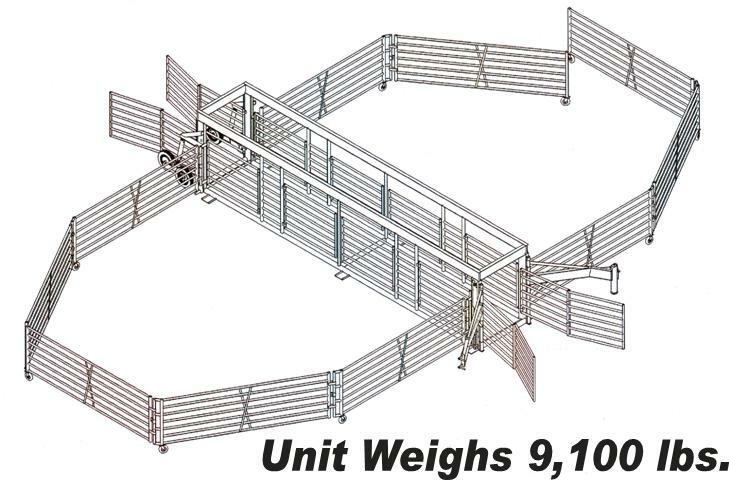 The rancher has 2 sorting pens measuring 15' 6" x 15' 6". With a height of all panels at 6'. Repeat steps for the opposite side. 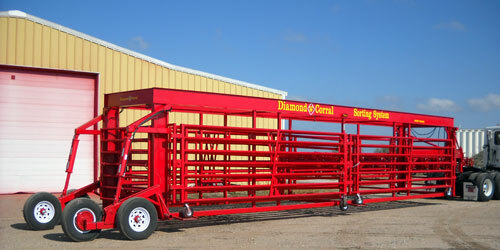 The Diamond W Corral is designed to save the rancher time with double hinged construction. This construction provides both the strength and mobility needed for uneven ground. All the panels are 6ft high and lifted by cable winches. The 6ft long side levers are used to easily change the rear wheel assembly for mobility in setup and transport. Figure 8 cattle through pen and never go through same gate twice. There are two gates to each pen on each side of the alleyway. The flow of the cattle starts at the rear of the unit. 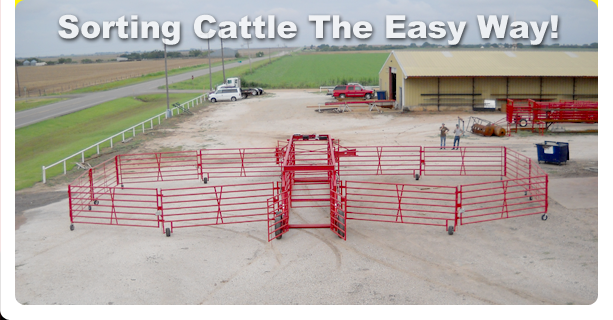 There is a gate for each pen that will angle cattle into each of the 4 pens. 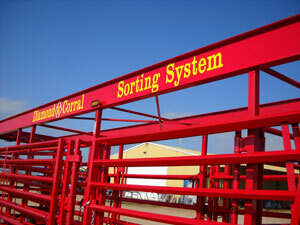 This allows for separating the cattle as they are fed into the system. From Sorting Cattle to Heading out in Minutes !